Today is the feast day commemorating the life and the martyr’s death of the twin saints Crispin and Crispinian (also called Crispianus or Crispian). Their lives are so shrouded in legend that the feast day was removed from the liturgical calendar, as their story may have been cobbled (ho ho!) together from several sources. Nevertheless, Crispin and Crispian are remembered as the patron saints of cobblers and all other workers in leather and lace. The legends have it that they were Roman brothers of distinguished blood, who fled Rome’s persecutions and went as missionaries to Gaul; they settled in northern France, near the Aisne River in the region of Soissons. There they made shoes to support themselves and the poor, preaching when away from the cordwainer’s bench. …during the Diocletian persecution they were brought before Maximianus Herculius whom Diocletian had appointed co-emperor. At first Maximianus sought to turn them from their faith by alternate promises and threats. But they replied: “Thy threats do not terrify us, for Christ is our life, and death is our gain. Thy rank and possessions are nought to us, for we have long before this sacrificed the like for the sake of Christ and rejoice in what we have done. If thou shouldst acknowledge and love Christ thou wouldst give not only all the treasures of this life, but even the glory of thy crown itself in order through the exercise of compassion to win eternal life.” When Maximianus saw that his efforts were of no avail, he gave Crispin and Crispinian into the hands of the governor Rictiovarus, a most cruel persecutor of the Christians. Under the order of Rictiovarus they were stretched on the rack, thongs were cut from their flesh, and awls were driven under their finger-nails. A millstone was then fastened about the neck of each, and they were thrown into the Aisne, but they were able to swim to the opposite bank of the river. In the same manner they suffered no harm from a great fire in which Rictiovarus, in despair, sought death himself. 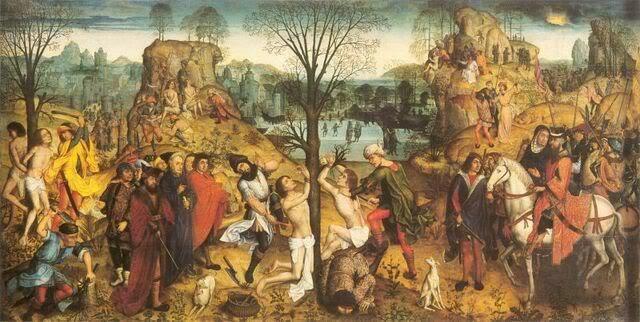 Afterwards the two saints were beheaded at the command of Maximianus. But though Crispin and Crispian set such an example of how to live and how to die, their feast is more commonly remembered for the battles fought upon it: the Battle of Leyte Gulf in 1944; the Battle of Balaklava in 1854 (in which occurred the famous Charge of the Light Brigade); and the Battle of Agincourt in 1415. This last (or first, chronologically speaking) was rendered most triumphantly by Shakespeare in Henry V, wherein King Henry rallies his much-outnumbered army. A year before that battle, English mercenary soldiers hired by the Duke of Burgundy had been executed on the spot by French forces loyal to Charles VI, despite the mercenaries’ attempt to take refuge in Soisson’s cathedral, which was dedicated to Saints Crispin and Crispinian. Henry’s speech, then, rechristens the day as one of English victory rather than English defeat, and the clouds of English arrows vindicate him. The day would not be complete without beholding Kenneth Branagh’s powerful enunciation of that speech. Ecce! They refused to drown!! HaHA! Also, they frolicked. Its sounds as though we would all be friends. I do recall the story about the millstones and cauldrons, but was not sure to which Saint they belonged. That it is these two is delightful. Although I am curious: how do cocktails relate to this research? Hahaha…well, for the most part they don’t relate to *this* particular Feast Day. Mostly I meant that feast days and cocktails both encourage my studies of history in a way that no teacher has ever done. That said, I’m looking up another October 25th happenstance that involves a LOT of bunch. Stay tuned. …which is to say, a lot of PUNCH. Different. A good reread for today!